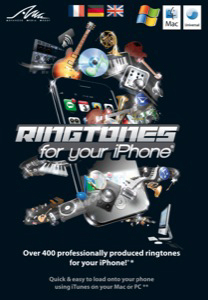 Ringtones for your iPhone is a collection of over 400 ready-to-load, professionally produced ringtones for your iPhone. Want your iPhone to stand out from the crowd? Want to give all your contacts their own unique ringtone? Then 'Ringtones for your iPhone' is for you. Over 400 new ringtones for your iPhone FAST! If you want hundreds of hot, new ringtones ASAP then look no further. Simply drag and drop the 400+ ringtones into iTunes, audition, select and sync with your iPhone as usual. Why settle for one ringtone when you can give each of your friends their own ringtone so you know who's calling the moment your phone rings? Ringtones for your iPhone gives you hundreds of ringtones you can quickly load into iTunes, audition and sync with your iPhone within minutes.